Composted Forest Products - What Are they? Composted pine bark, forest products and sometimes forest humus, are often listed in the contents summary on many bags of commercial potting soil. What are they? Composted forest products, sometimes called forest humus, is such a broad term that it defies definition. It is composed mostly of the collective waste from the milling process, saw dust and shavings, of different particle size from the different stages of milling and anything else, other than bark and wood chips, that is able to be salvaged. It’s unlikely you will find a bag of composted forest products in the big box stores or garden shops, however you might be lucky getting it from a local mill. Making your own, by using sawdust, wood shavings or bark for garden paths and leaving it for 1-2 years before raking it up into a pile, like in this photo, is as close as you will get. In the process of milling pine log for timber the first step is to remove the bark. This is usually done with a machine called a de-barker that peels away the bark leaving the log clean and ready for the mill. While it is not the intention often in the process some of the underlying timber is also stripped along with the bark. The compost process, in both cases, involves piling the pine waste into heaps and left for nature take its course. The piles begin to decompose like any pile of organic material will if left long enough. It is then run through a series of screens to separate sizes and sold under a number of different names depending on the particle size of the finish product. The smallest screening is usually the product that is included in potting mediums. If you know anything about compost you know it takes a great deal more than just a high carbon material like pine bark to make compost. Although both these products do produce a fair amount of heat in the pile and are to some extent cooked like compost, the product has little or no nutrient value at all. Be aware of what you are buying, or more to the point, about how you interpret the meaning of the word composted. It is composted, actually aged is a better description, not compost, a big difference. 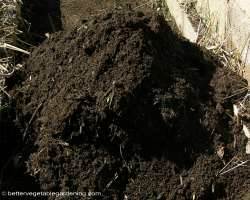 Compost in most people's mind, brings forth images of a fertile plant growing medium teeming with soil bacteria and organism's ready to supply plants with all the nutrition they require. Unfortunately neither of these products are anywhere close to that. Both products are used as a cheap replacement for some of the peat component in a potting medium whose purpose is to provide drainage and air spaces within the mix. 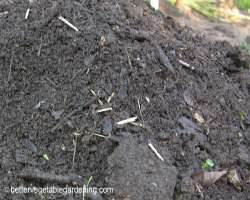 Composted pine bark: In the right place, some specialized potting mixes and potting mixes for older potted plants, it is an acceptable substitute for some of the peat component and there is some suggestion that it is a source of trachidermia fungus, a natural fungicide which will protect plants from soil borne pathogens. However it is a poor addition to a potting mix that is going to be used for raising vegetable seeds and young seedlings. Composted forest product: is also used as a cheap replacement for some of the peat component in a potting medium however composted forest product are usually a lot finer than pine bark and often fails in the purpose of providing drainage and air spaces within the mix. It too is a poor addition to a potting mix that is going to be used for raising vegetable seeds and young seedlings.